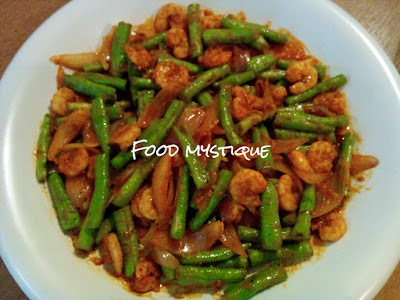 Food Mystique : Spicy Chinese Long Beans with Shrimps - an easy and simple but tasty recipe of beans that are quickly stir fried with shrimps as a crunchy and spicy side dish to rice. Hello, my name is Kim; author, cook and photographer of this blog where you will find delicious recipes which have been tried, tested and created to be as easy and healthy as possible. Spicy Chinese Long Beans with Shrimps - an easy and simple but tasty recipe of beans that are quickly stir fried with shrimps as a crunchy and spicy side dish to rice. 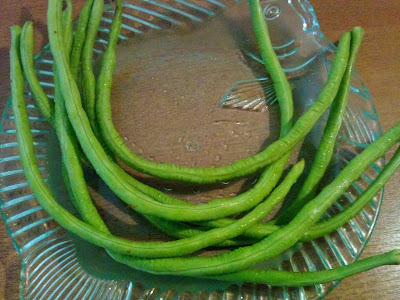 Whenever I have eaten too much of meat and rich foods, I will just go for simple dishes the next day and Spicy Chinese Long Beans (Yardlong Bean) with Shrimps is one of them. The feel of lethargy ceases to remain when it meets with the light, crunchy and spicy taste of this dish. This reminds me of my school days. Have you ever made fun of classmates during your school days by giving them nicknames and those of vegetables? I have and there was a season when together with my group, we nicknamed our classmates as Long Bean, Pumpkin and Rotten Chilli, etc. Sounds unkind but surprisingly were taken in stride as a joke and received our fair share of nicknames in return. Thankfully, we managed to outgrow that childish season shortly after. 1/4 tsp salt or according to taste. Remove the heads and shells of shrimps. There is no need to devein as they are small sized. Slice beans into 1 inch lengths. Mince the garlic and shallots. Slice onion into 12 wedges, remove root ends and separate into pieces. Saute minced garlic and shallots in heated oil until aromatic and lightly browned. Add beans, shrimps, chilli powder and stir a few times to mix over high heat. Add water, give it a stir and then mix in onions, fish sauce and salt. Quickly stir fry until cooked; beans should be cooked but crunchy and shrimps not overcooked. Dish out onto a plate and serve with rice. ** Shrimp heads can frozen together with other batches to make seafood stock when enough has been collected. 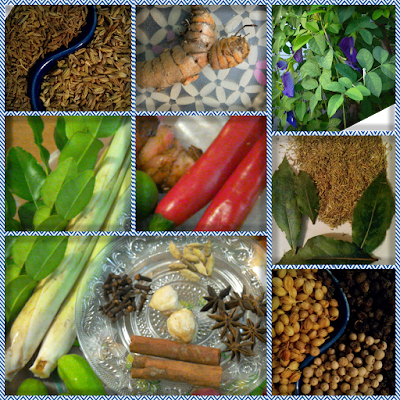 Introduction to Herbs, Spices and Ingredients to spice up your foods and cause your taste buds to encounter a tantalising and unforgettable experience.
" 'Keo' Masak Belanda" - a simple but tasty and unique dish of aubergine and prawns. Glass Noodles with Enoki Mushrooms - springy and 'chew-licious'. Stuffed Fish with Chilli - a special Malaysian style of eating fish that is fragrant and spicy. Glass Noodles with Mixed Vegetables / 'Chap Chye Tanghoon' - a popular traditional Chinese dish. Braised Chicken with Celery - simply tasty in Chinese style. Copyright 2018 Food Mystique. Simple theme. Powered by Blogger.